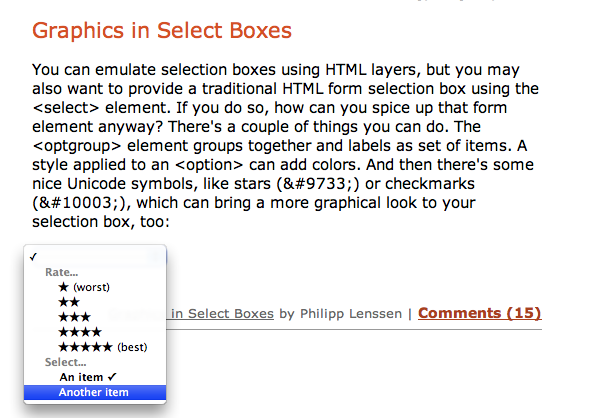 Good idea so far, but you can – except for IE – display background-images in select-boxes with CSS. Cool! I didn't know about the colour thing. That's really useful! Thank you! 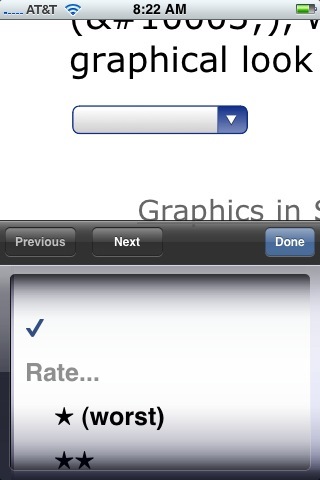 When viewing the select box on the iPhone, there are no colors shown, everything is a default black color. 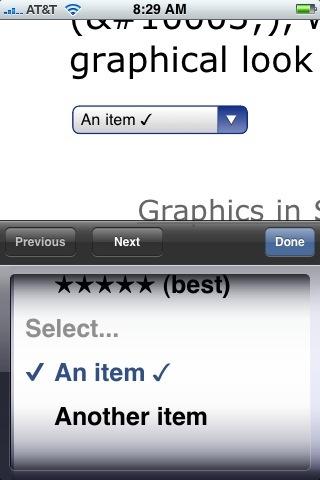 Also, the first blank option is selected so it shows a checkmark next to nothing. Yeah, the list of browsers to test against never seems to get shorter. Now you have to throw in mobile browsers like mobile Safari or Opera mobile edition. "Although if you select one it shows up as black"
That's because the one displayed there is styled by styling the <select> itself. In Firefox at least, some browsers does it differently. "Good idea so far, but you can – except for IE – display background-images in select-boxes with CSS." Unless it's an enhancement rather than a requirement. Like in Michael Fagan's example above. Pretty much looks identical to what I see on the iPhone, including the checkmark behavior. I'd like to argue that select boxes/ drop-down menus for poll-like RANGE of even a few items should be avoided at all costs. Bad UI by default. If you need to pick something out of a range of kind items, use radio buttons instead, arranged side by side with no gaps between buttons, and the "worst" and "best" labels flanking the group left and right. Instant one-line overview/ visual feedback! E.g. WORST <input name="test" type="radio"
The site above has some cool radio buttons that have a star shaped that gets filled in. > E.g. WORST <input name="test"
The recent interface fashion suggests to use a dynamic scripted row of graphic stars which react on-hover, but I'm not always too happy with that, especially since it often does not differentiate between stars-that-are-editable-and-clickable vs stars-that-are-merely-displayed (take a look at the Google Groups interface, which in some situations has one row on top and one at the bottom, and you're left to guess which is editable!). Sometimes, a simple dropdown box *may* be more discoverable and easier understood – not quite sure. choice, with but two end-labels, would come out far ahead as better ergonomic solution for polling user input, than a vertical one with labels for each choice. I definitely agree with that. Does a single star taken on its own represent "better than nothing/ worth a star!" or does it represent "really bad, only one star!"? So I think if you do have such a stars interface it makes sense to use the additional label "worst" or "bad" next to your one-star icon to get the point across. As for the vertical vs horizontal direction, interesting point to consider, too. In the case of a single star for rating, one solution is to add the rest of the stars and show them faded. This way the user will recognize the set of stars and see that only one is filled. The emptiness will easily be conceived as bad, while fullness will surely mean good in most cases. Fact is that the star itself isn't a good choice either for bookmarking or rating, because it doesn't have either symbolic or iconic relations to the object or action. If you look at the star, you will understand it's function only by it's context, and by the fact that loads of websites have used it for rating, so it's (kind of) a convention, which brings us closer to the symbol, but yet it's not an all-round convention, rather it's one specific to the vocabulary of websites. So it required the average user to learn such vocabulary before the communication becomes intuitive. For such reason a more effective symbol should be used in place of the star.